Add 2 Year Extended Warranty - $206.00 ? CyberData’s Try & Buy program allows you to order QTY (1) of any SIP device and try it for 30 days to determine if it will meet your needs. When “Try and Buy" is selected, we charge on shipment and we will apply a credit IF the product is returned through our RMA process within 30 days, in good condition in its original packaging. Once returned and upon inspection, CyberData will apply the credit to your credit card, less any shipping and handling charges that CyberData incurs. No returns are accepted after 30 days under our Try & Buy program. 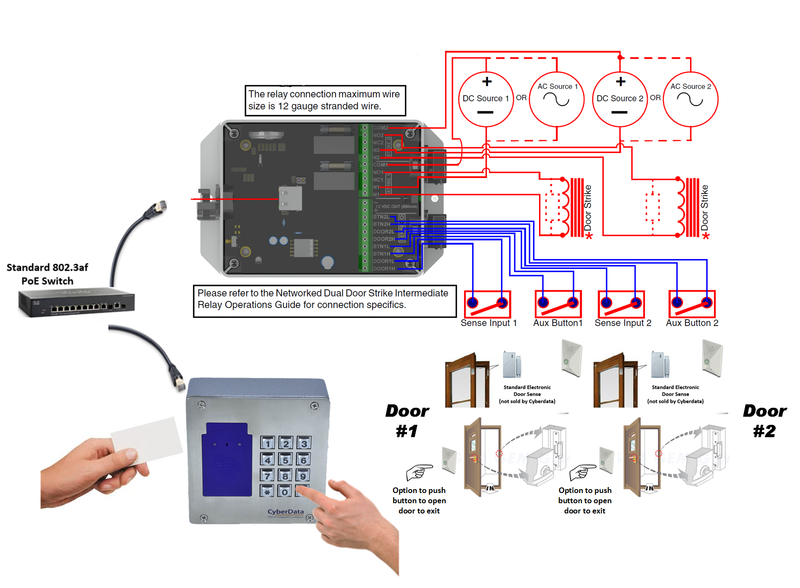 The SIP-based RFID/Keypad Secure Access Control Endpoint uses the existing VoIP or PoE network infrastructure to securely unlock and lock gates or doors. PoE powered and in a secure outdoor-rated case, the RFID/Keypad Secure Access Control Endpoint can store up to 500 access codes. There is a blacklisted code list that when activated, will make a phone call and play a pre-recorded message or can broadcast a multicast message to IP speakers when registered to the VoIP server. Good code and blacklisted code lists can be updated on the web interface or autoprovisioned by a remote server. CyberData has implemented a high level of security on its RFID products. Data between the card and the reader are encrypted using AES128 making sure that hackers would not be able to “spy” on the cards data being sent to the reader and duplicate that card to provide access. When a card is read, there is an additional security step. The reader and the card go through a complex mathematic process where they compare encrypted security keys. This process is called Mutual Authentication. It guarantees that communication between the card and the reader can never be copied and used to produce a duplicate card. On a good read, the keys will match and the reader will extract the encrypted data from the card to validate if the card is active in the system. If the keys do not match, the card will be rejected. CyberData has maintained one of the most comprehensive list of IP PBX servers certified to work with CyberData VoIP products. Device ships with 5 RFID cards and instructions. *Dimensions are measured from the perspective of the product being upright with the front of the product facing you. How do I upgrade my firmware? Go to the Downloads tab, click on the serial number range matching your device and download the firmware compatible with it. V3 Firmware is not backwards compatible. Please contact VoIP Technical Support for assistance before attempting a firmware upgrade on a Pre-V3 device. To load the firmware from your PC, see your Operations Guide. What IP phones do you recommend for setting up a Peer to Peer with this device? The relay does not work. How do I fix this? If the relay test button is working, the problem may result from interfacing with the IP phone where the DTMF tone is generated. To resolve this problem, please verify that the DTMF tone on the phone is set to out-of-band. I was able to register your device with our SIP server, but when I tried to enter a DTMF tone there was no function. Make sure your SIP phone is set to 101 for the DTMF payload type (Out of Band RFC2833). After a period of time, my device stops working or is unreachable. This is a common problem when the re-registration time value is not set correctly. On our device, you need to make sure that the re-registration time value (in minutes) is less than that is set on the IP-PBX server. On an Asterisk-based VoIP SIP PBX system, the CyberData SIP Device status is "Busy" or "Unreachable." In the PBX setup page for the extension of the CyberData device, find the Qualify= value and change it to NO. If the Qualify= value requires a numeric value, then change it to 0. Note that on some Asterisk systems (such as Intuitive Voice) this value is called the Heartbeat= value. Set the Heartbeat= value to NO, and then save the settings. Also, on the product's SIP Setup page, make sure that the Register Expiration (minutes) setting is set to less than 6 minutes (5 minutes is good) because it needs to be a value less than the Asterisk default value of 6 minutes. Save the settings after changing the Register Expiration (minutes) setting. What type of audio files can be uploaded into the intercom? RIFF (little-endian) data, WAVE audio, Microsoft PCM, 16 bit, mono 8000 Hz. You can use the free utility 'Audacity' (http://audacity.sourceforge.net/) to convert audio files into a format the device can recognize. When you export an audio file with this program, you can save the output as "WAV (Microsoft) signed 16 bit PCM." Where can I specify the name of the device? You can enter the desired device name (such as ?Door Intercom? [up to 25 Characters]) into the Extension ID field on the SIP Config web page. I see in the electrical connection diagram in the Users Guide that there is a High PIV Ultra Fast switching diode. Do I need it, and if so do you have a source? This High PIV Ultra Fast switching diode prevents CEMF kick back from an intermediary relay coil when power is cut and the coil field collapses. You could use an On-Semi MUR105 diode. We have the Cisco 3550 switch and it looks like the unit is not able to negotiate the power with the switch. It keeps cycling over and over. This happens because with default settings, the switch port is resetting power too quickly. Therefore, on the 3550 switch, on the switch port that the unit is attached to, please try adding the following CLI command: power inline delay shutdown 20 initial 300. That should keep power supplied until the unit can boot up all the way. The CyberData device connected to a Dell Powerconnect 3524P or 3548P port did not stay linked up. The device comes up, and then it goes down, and then it comes up cycling. If connected to a Linksys SRW208MP switch, the CyberData device stays up. Pantel, Cisco, or Linksys PoE endpoints all work on the Dell Powerconnect 3524P. A user tried hard coding the switch speed/duplex and tried four different Dell Powerconnect 3524P switches. Check to make sure the Dell Powerconnect 3524P has flow control enabled on the port for the CyberData device to power up properly. According to Dell: Flow Control Support (IEEE 802.3X): Flow control enables lower speed devices to communicate with higher speed devices by requesting that the higher speed device refrains from sending packets. Transmissions are temporarily halted to prevent buffer overflows. For information on configuring Flow Control for ports or LAGs, see "Defining Port Configuration" or "Defining LAG Parameters" in the Dell PowerConnect 35xx Systems User's Guide. I am unable to connect with the unit when it is plugged into a Cisco SLM 224P switch. Use for hubs and switches. MDI Use for end stations. I have a Cisco 6513 switch. When I plug in a CyberData VoIP device, the device constantly reboots and will not register to the SIP server. Please adjust the switch power selection to Power inline static, as opposed to Power inline dynamic. This will allow the device to continuously receive 15.4W of power. I have registered the device on Cisco Call Manager but am unable to register the device's Nightringer using the device's MAC address. How do I configure two extensions on Call Manager for the device? Create a second directory number and user for the Nightringer extension. You may need to fudge a digit of the MAC Address so that Call Manager allows you to associate it to the new user. Be sure this MAC address does not match any other CyberData devices on your network. I have a Cisco Catalyst series switch. How do I set the unit so that it can use PoE (under 15.4w) instead of an external power source? There are known PoE limitations with third party devices on the Cisco Catalyst series switches. This includes the 2500, 3500, and 6500 series switches. It's important to keep in mind that CyberData devices are considered third party devices and require switch port setting adjustments. Be sure to turn power policing off if it has been enabled on your switch. Power policing is disabled by default. Also, configure your port for no shutdown. Use the following command to configure inline power: power inline static max 15400. How loud is the speaker on the Intercom? The average Intercom volume level is 9 SPL using the standard 1KHz test tone normalized at 0dB and yields 93dB output at 1 meter. I discovered water corrosion damage inside of the Intercom box. How did this happen? 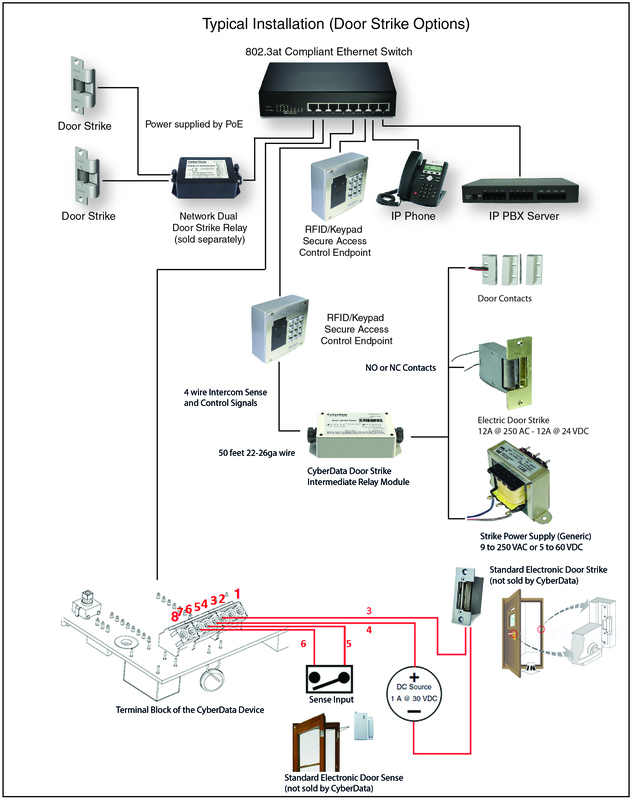 Please read the Intercom Installation Errors document to identify any possible installation errors. I mounted the VoIP Intercom at an outside truck loading area, but the voice of the person speaking into the Intercom sounds "chopped up" at the designated IP phone. How can I improve the sound coming from the Intercom? Even though the Adaptive Full Duplex mode of the VoIP Intercom compensates for some ambient noise, it cannot overcome the noise of trucks, cars, or other high noise sources near the Intercom in an outdoor environment. Some of the issue can be improved by mounting the Intercom at a location that shields and directs the sound to and from the user (such as a tube or recessed housing). Alternatively, a Push-to-Talk firmware upgrade can be installed. Contact CyberData Technical Support for help. When I press the call button, a static discharge to the button causes the intercom to lock up and lose connectivity and then reboot. When the intercom reboots, it never establishes a link until PoE (power over ethernet) is removed and re-established. What should I do to prevent this from happening? Be sure to refer to the Installation Quick Reference Guide for wall mounting or gang box mounting installation options. The intercom must be electrically grounded. This will prevent static electricity from interfering with the intercom operation or damaging the unit. This relay can be used to trigger low current devices like strobes and security camera input signals as long as the load is not an inductive type and the relay is limited to a maximum of 1 Amp @ 30 VDC. 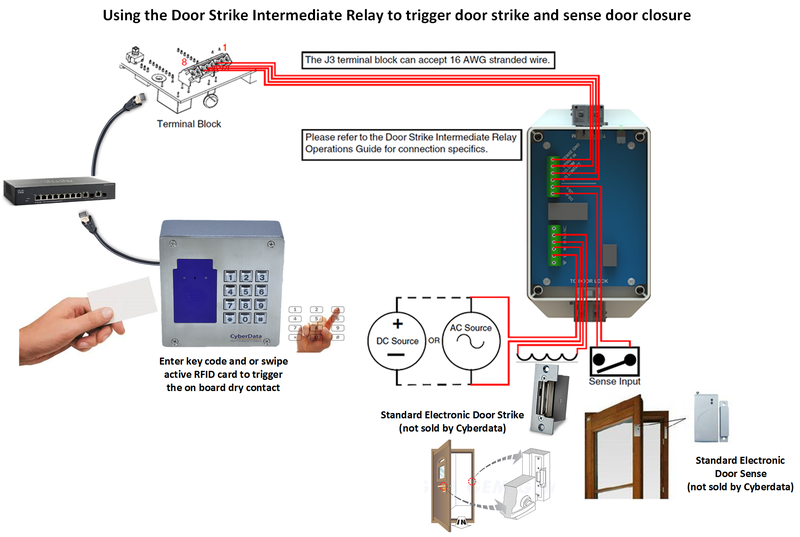 We highly recommend that inductive load and high current devices use our Door Strike Intermediate Relay Module product (CD# 011269). We highly recommend that inductive load and high current devices use our Networked Dual Door Strike Relay product (CD# 011375). ZIP The SolarWinds TFTP server is used when autoprovisioning firmware updates or audio files. ZIP The Discovery Utility scans the network and reports back any found VoIP devices that are attached to the physical network.